This statue of Abraham Lincoln and Archer Alexander sits adjacent to the Park Plaza Hotel in Boston. When Charlotte Scott, an emancipated slave, heard of President Abraham Lincoln's assassination, she decided to start a fund that would go towards a memorial to Lincoln. Through Scott's inspiration, $18,000 was donated towards the building of a monument. The money was raised entirely from emancipated African Americans. The original statue resides in Washington, DC. 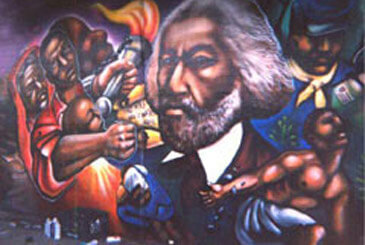 Frederick Douglass gave the keynote speech at its memorial dedication on April 14, 1876. Thomas Ball of Charlestown, MA, sculpted the statue. The statue is supposed to be a life-size depiction of Lincoln. The slave is meant to be breaking his own chains and is based upon a picture of Archer Alexander, the last slave to be captured under the Fugitive Slave Law. Moses Kimball, a Massachusetts legislator, ordered a replica of the statue, which was dedicated in 1879. This copy is located at 1 Columbus Avenue, next to the Park Plaza Hotel.